If you've always wanted the look of a vintage Jaguar but they were too big, left hand drive, unreliable or easy to get parts for in America, one Japanese company created a not so perfect solution. Behold the Mitsuoka Viewt. Built on the body of a Nissan March by a Japanese company that specializes in unique automotive design interpretations, this strange vehicle is currently for sale on Ebay. A Nissan March is rare enough in the United States where the car has never been sold during the model's nearly three decades of existence. 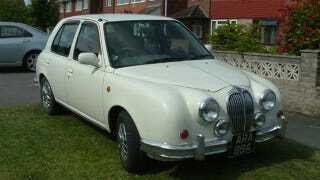 Accordingly, a Nissan March with the appearance of a vintage Jaguar like this one currently on Ebay truly lives up to the seller's billing of rarer than rocking horse dung (their words, not ours), even in the UK where this "baby Jag" is currently located. Why you would go through the inevitable disaster of trying to import this weird vehicle to America after purchasing it for $20,000 is a little beyond us, even when you take the novelty factor into account. This Nissan manages to mirror almost none of the original Jaguar design, it's a four cylinder automatic and it's wrong hand drive. More importantly, spending that kind of money can buy you a real Jaguar with all of the beauty, power and unreliability they've become so well known for. If you just can't live without a Nissan March that looks like a vintage Jag, you're in luck. You have plenty of time to try and cure yourself before the Ebay auction ends 14 days from now.